Easily share information about your BI systems with other departments and business users with BI xPress Server, which delivers the monitoring console functionality to users without requiring a local desktop installation. 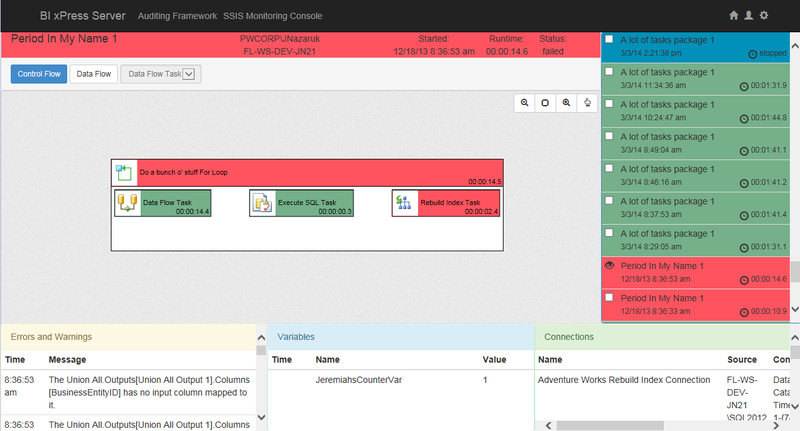 The SSIS Monitoring Console allows your team to watch SSIS package execution down to the tasks and components for packages that contain our Auditing Framework. Control Flows within the Monitoring Console contain precedence constraints for nested tasks such as Sequence Container, For Each Container and more. Also, tasks and components can now be moved around freely on the page to get a better view of some clustered items. No client-side software is required, just a web browser. 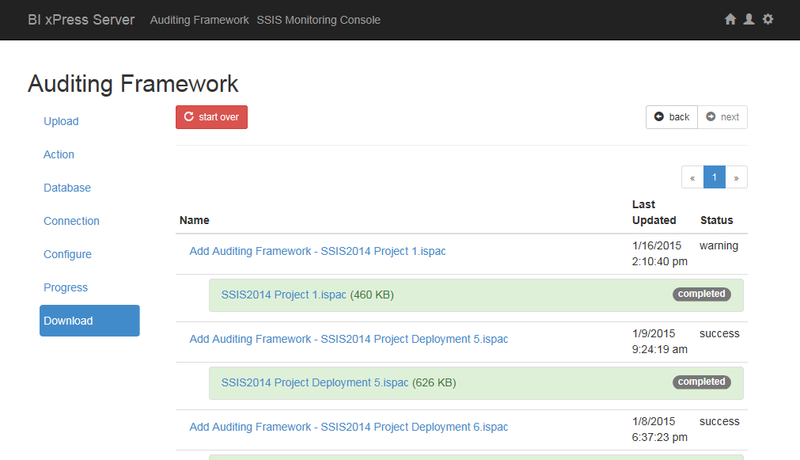 The server-based Auditing Framework allows your team to apply or remove the Auditing Framework from your SSIS 2012 and later projects (ISPAC files) within a web browser*. Enable your SSIS packages to come to life with more information, such as performance metrics, data counts and detailed error messages. If you need to integrate the adding or removing of the Auditing Framework with other automated processes, you can take advantage of the Command Line tool for Auditing Framework, available with the BI xPress Server*. * The Microsoft SQL Server SSIS runtime for the version(s) of SSIS you wish to support must be installed on the same machine as Workbench Server (which hosts BI xPressServer and DOC xPress Server). Integrate the power of BI xPress Server into your SSIS Packages. The Notification Engine allows you to send notifications to multiple groups or individual people via email, SMS, log files, SQL Scripts, or even Twitter. You can also build your own notification provider to suit your needs. 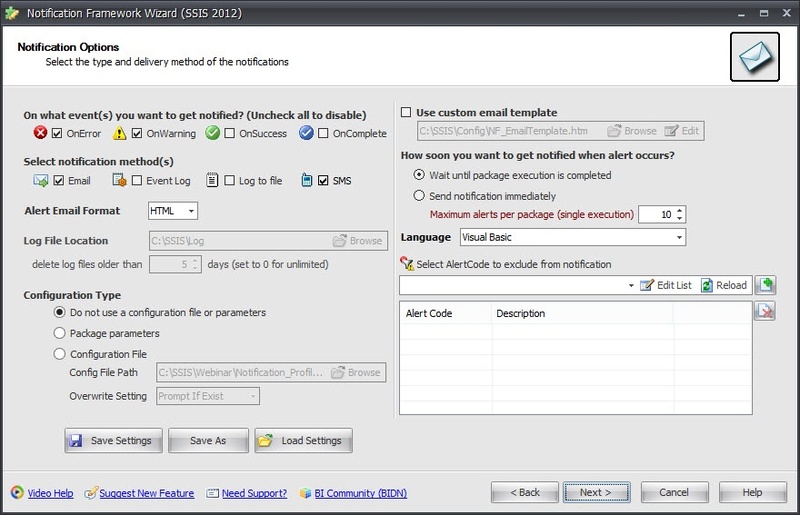 The BI xPress Notification Engine is also a Visual Studio Team Services provider and includes a default template for creating VSTS notifications.